Feasterville Business Association - Times Publishing Newspapers, Inc.
Now marking its 69th anniversary year, the Feasterville Business Association is comprised of more than 100 top business owners, executives and government officials. The professional organization offers monthly networking and general membership meetings with dinner and a featured speaker. The mission of the FBA is to foster and encourage growth and progress for the betterment of the community. What makes the FBA truly unique and special is its strong community service component. Among the major aspects of its community participation is the FBA’s annual golf outing, now just completing its 27th tournament. With proceeds raised from this event, the FBA contributes thousands of dollars to charitable and communal endeavors. Money raised from this event also funds college scholarships for area high school seniors and the association’s annual Easter Egg hunt for children from toddlers to 12-years of age and their families. A long time participant and supporter of the Lower Southampton Township July 4th Parade and Celebration, the FBA has now assumed the role as the lead sponsor for the community wide patriotic salute to America. The FBA additionally singles out an outstanding Person Of The Year for their service to the organization and the community-at-large. The award is presented at their annual Frolic attended by members, guests and government representatives. The FBA additionally conducts a holiday Blue Light Tree Lighting to honor police officers who have made the ultimate sacrifice in the line of duty. The FBA also supplies holiday food baskets to families in need. Its special military flag ceremonies performed at the Lower Southampton Township Building are part of an on-going program to call the community’s attention to our area’s military heroes serving around the world. Membership to the FBA is open to anyone who resides or does business in the Lower Southampton area. For additional details, contact the FBA at 215-436-9768 or e-mail FeastervilleBA@gmail.com. 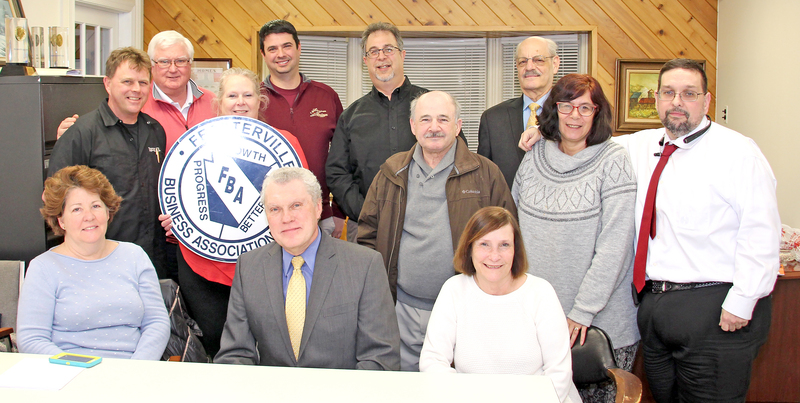 PHOTO CAP: Charles Roman (seated center), newly elected president of the Feasterville BusinessAssociation, takes time out at his first executive board meeting to share a photo with newly elected officers, board members and association members. Pictured with Charles are, seated from left, Diane Fetscher and Linda Pupkiewicz, and standing from left, Rick Tyrrell, Michael J. Hughes, Tracy Freels, Fran Mishinkash, Ron Hyman, Ted Hauptman, Ray Greenberg, Susan Harrison and Ed MacConnell.